The forum in St. John’s was the eighth event in a two-year NEADS’ Job Search Strategies Forums Project, addressing practical aspects of successful transition from school to the employment market. Delegates represented a number of colleges and universities, primarily in Newfoundland and Labrador. Student participants were attending the following post-secondary institutions: Memorial University, Keyin College, Marine Institute, Sir Wilfred Grenfell College and St. Thomas University. Altogether 55 people took part in the day-long employment session: students, graduates, employers, career counsellors/professionals and representatives from non-governmental organizations. The NEADS St. John’s Job Search Strategies Forum included two workshop panels, an exhibit area, and one-on-one resume consultations with career counsellors or HR professionals over the lunch period. The exhibit area included displays and representatives from: BMO Financial Group, Convergys Corporation, Employment Equity and Strategic Initiatives Division - Government of Newfoundland and Labrador, Husky Energy and the Independent Living Resource Centre. Jennifer Dillon welcomed participants, and introduced herself as the Job Search Strategies Consultant for the National Educational Association of Disabled Students (NEADS). She explained that the current Forum in St. John’s is the eighth of eight, preceded by similar events in Toronto, Edmonton, Victoria, Montreal, Halifax, Ottawa and Winnipeg. The Forums started in August 2005, and the St. John’s Forum concludes the NEADS’ two-year cross-country project. Jennison Asuncion, NEADS’ former Vice President Internal and current Senior Advisor, said students with both visible and invisible disabilities run the Ottawa-based organization. The Board is currently seeking a representative for Newfoundland and Labrador. “Our previous president came from Newfoundland and Labrador, so we have a proud history with this province,” he said. The film features short statements from representatives of the different recipient organizations. “NEADS is important for those young people out there who don’t have anywhere to go,” visually impaired Crown prosecutor Jason Mitschele (NEADS former Ontario Representative) said. Whitney Muse said, “My limitations are only what I can dream.” “If we want a country that is entrepreneurial and caring,” said Franca Gucciardi, “we need to ensure young people are given tools to live up to that.” Gucciardi received the first scholarship from the Canadian Merit Scholarship Foundation, and is now its executive director. Dillon said both American Sign Language (ASL) and closed-captioning would be used and that one-on-one professional resumé advice and career counselling would be available during the lunch break. Stephen McDonnell of BMO said that “we believe there is an untapped market of capable intelligent people ready to enter the workforce.” In 1992, BMO launched a task force to look into employment of people with disabilities and the creation of a barrier-free workplace. The task force uncovered several misconceptions, he said, including the notion that people with disabilities take a disproportionate amount of sick leave. Research showed that 80% of accessibility needs could be accommodated at a reasonable cost. McDonnell stressed the importance of completing one’s education. He advised participants to “captain your own team,” by gathering human resource or university placement officers and others to provide help and advice in the transition from school to work. Videotaping mock interviews, he said, provides invaluable information for job seekers—for example, whether they inadvertently hold their bodies in a hostile position. McDonnell outlined strategies to identify and research companies that are hiring, have inclusive values, and might be a good fit for people with disabilities. Every bank, railway, and airline is seeking a representative workforce, he said. “It’s their obligation. They are actively trying to recruit you. It’s important to identify yourself.” He told participants to review corporate websites, corporate literature, and the organizations for which members of their board of directors volunteer their time. Resumés should present a strong, positive impression, McDonnell said. They should list key words noted in the job advertisement, be less than two pages in length, and include both education and volunteer experience, because the latter is a form of employment and training. He recommended the use of active terms, and a careful review to ensure the final document is free of typographical errors and misspellings. Know what he or she has to offer and clearly articulate these abilities. Confirm the date, place and time of the interview and ensure it is accessible. Bring extra copies of resumés. Obtain the consent of listed references. Lacking real job experience is an issue for many people, said McDonnell. He told participants to stay in touch with university professors who might be used as references. Andrea Augot distributed a handout of common interview questions and called on two volunteers to role-play two interviews. The first showed potential candidates what not to do, while the second showed the difference it makes when a candidate is confident and articulate. Augot told participants that most job seekers question whether to tell an employer of a disability. Doing so during an interview would allow the candidate to have his or her needs met, one participant said, leading to a more efficient and effective job performance. Augot said disclosure also shows an employer that the job candidate is honest and comfortable with his or her disability. “What’s the worst that can happen if you disclose?” Augot asked. It threatens the safety or property of others. It prevents the applicant from safe and adequate job performance. She said candidates can disclose disabilities in their cover letter if the company is an equal opportunity employer and has a diversity plan in place. An applicant can determine this by researching the company online, calling the employer, and speaking with employees and other people who have used the company’s services. Disclosing a disability when invited to an interview may be advisable if accommodations are needed for the interview itself, such as an interpreter or wheelchair access, said Augot. If disclosing the disability during the interview, candidates should do so right away, perhaps by saying, “I’d like to let you know that I’m hard of hearing. I use lip reading and may ask you to repeat a question,” and then sharing any accommodations that would be necessary in the workplace. If a disability is not disclosed by the end of the interview, Augot said, there is a risk that the information may come subsequently from a reference. “It can make you look dishonest and not comfortable enough to talk about your disability,” she said. Lanie Woodfine, Information and Networking Coordinator for ILRC in St. John’s, said candidates who disclose a disability immediately after the job offer put the employer on the spot. “The interview is your opportunity for good communication… a time for trust and respect for both parties,” she said. “Be as honest and factual as you can, and indicate what accommodations you may require,” said Augot about how to disclose a disability. “If you need adaptive technology, research it. Know what it does, what it costs, and where it can be purchased.” She encouraged participants who do not know what adaptive technology they might need to visit ILRC and discuss it with an adaptive technology coordinator. Kimberley Joy said the Office for Employment Equity for Persons with Disabilities is building a public service representative of the population that it serves. It provides province-wide employment programs and services within the provincial government. The focus of its employment programs is on education rather than experience, said Joy, in recognition of the barriers that persons with disabilities face in the labour market. The organization’s Student Summer Employment Program provides eight to 10 weeks of career-related work experience for post-secondary students with disabilities. Attendance at a post-secondary educational institution with a return to school in September and registration at the Office are the only requirements for eligibility. Salary costs are funded 100% by the Office. More than 100 students have received placements since the program began in 2001, and positions are filled based on an informal matching process. Joy said Transportation and Works, Natural Resources, Justice, Tourism, Culture and Recreation, and Health and Community Services are among the provincial departments working with the program. The Wage Subsidy Initiative offers post-secondary graduates cost-shared contractual opportunities within the provincial government. “It gives graduates an opportunity to get their foot in the door… in the labour market in their field of study,” Joy said. Eligible applicants must be either Employment Insurance (EI)-eligible, in receipt of income support benefits, or currently underemployed, and must register with the Office. Opening Doors, the Office’s core employment program, is “made up of 75 permanent Opening Doors positions across the province.” While these positions are currently filled or in the process of being filled, Joy said she hopes that more will be available following the upcoming budget announcement. Joy said the registry comprises a pool of 750–800 clients and reflects a variety of skills, backgrounds, and levels of education. The Enabling Resource Centre offers adaptive equipment, software, and employment counsellors. Clients who cannot get to the Centre can request that materials be sent to them, or get information on resources in their region. Opening Doors to Success magazine and the Office’s website, www.gov.nl.ca/openingdoors, are two more communication tools available to clients. Clients can access the Office’s programs and services by completing an application form either at the Forum or on the Office’s website, submitting a current, detailed resumé, and submitting proof of education. Lisa Gushue spoke to the group about achieving career goals, disclosing disabilities to employers and how the Office for Employment Equity for Persons with Disabilities has supported her over the years in achieving her career goals and overcoming employment barriers. Gushue thanked the staff at the Office for Employment Equity for Persons with Disabilities for the tremendous support and encouragement they have shown her and others with disabilities over the years. The programs offered allow individuals with disabilities to gain valuable work experience and are instrumental in assisting individuals make their initial move from post-secondary education to employment in the public service. She applied to the Opening Doors Program during her first year of university and was the successful candidate for successive summer positions with the Department of Government Services and Lands and the Eastern Health and Community Services Board. Through these positions she gained valuable experience in working with the public. Gushue recommended that participants keep up to date with the programs and services available to individuals with disabilities and in regular contact with the staff of the Office for Employment Equity for Persons with Disabilities. The employment counselors can review your resume and cover letter and offer you useful tips on preparing for an interview. “It is wise to research your potential employer and prepare potential interview questions and answers and do mock interviews with a friend”. McDonnell said he often looks for volunteer experience, particularly in a field of the candidate’s expertise. For example, if a candidate has a degree in accounting, he would want to see that he or she had helped to manage the budget of a not-for-profit organization, or worked on the production of its annual reconciliation. “That’s the type of volunteer effort that translates into real work,” said McDonnell. Joy told another participant who has looked for work since completing a degree in 2003 that while there are provincial and federal programs designed for recent post-secondary graduates, the Office for Employment Equity for Persons with Disabilities programs has no timeframe requirement. She recommended that the participant also contact the Canadian Council on Rehabilitation and Work, which runs a Partners for Workplace Inclusion Program. McDonnell said that if the participant had done volunteer work related to her field of study it could enhance her resumé. A participant asked whether programs educate potential employers about accommodations needed by workers with disabilities. McDonnell said approximately 500 federal employers in Canada are required to have disabled people on their workforce and have accommodation specialists. “We’ve also welcomed home people from two wars. We’re very understanding of accommodation needs.” As people age in the workplace and often require accommodation, many companies are familiar with the needs of employees who acquire disabilities. 2,000 federal contractors across Canada are also required to have a representative workforce. Joy said all managers receive training on disclosure and disability issues. She told participants not to leave an employers’ education to others. “Make sure you are involved in co-operation with your employer about your specific needs,” she said. Asuncion asked whether an employer could legally ask about accommodation requirements before a candidate has introduced the subject. McDonnell said while questions about a candidate’s disability are not legal, human resource professionals are trained to ask everyone they interview if he or she has workplace accommodation needs. A participant said candidates should understand their technology needs in advance of an interview. McDonnell recommended that candidates maintain their skills with adaptive technologies and develop confidence in their skill level before adding competence in a technology to their resumés. Participants can use the ILRC’s adaptive technology program, Augot said. Denise Hooper said that while it can be a challenge to find meaningful work, jobs are available and can be acquired through proper strategies. She advised participants to examine their likes and dislikes, such as working with computers or dealing with people, and to evaluate skills acquired through volunteer experience, hobbies, attendance at professional conferences, event organization, and group leadership. Setting personal priorities allows job seekers to establish short and long-term goals and could include opportunities to travel, job security, money, and prestige, Hooper said. To choose the right path, job seekers must match their personal interests and qualifications with the requirements and rewards of specific careers. Hooper recommended the local campus career centre, Human Resources and Skills Development Canada (HRSDC) offices, the Blundon Centre at Memorial University, government offices, local libraries, and the Internet as good places to research career choices. Hooper said participants could use internships, part-time employment, and summer employment to acquire experience in a field of choice. If these opportunities are not available, participants should seek out volunteer positions related to their field. Participants should also conduct labour market research and talk to people who already work in their field of interest. Potential avenues include the phone book, career fairs, campus employer information sessions, and online job listings. Hooper recommended making contact by phone, in person, or through networking letters. She said that 85% of job vacancies are not publicly advertised. When she was looking for work, Hooper said she focused on a potential employer where she already knew a senior decision maker. Hooper contacted her every single week and eventually got work as a janitor. A few weeks later, she was offered a job as an instructor, and several months after taking the position was appointed principal. Job seekers need to use all available contacts—friends and family—to get the word out, she said. She said that participants should carry copies of their resumés at all times, and make frequent contact with potential employers by telephone. Conduct research of employers of interest, whether or not a position is currently available, she said. She advised participants to research growth areas in the economy, such as the oil and gas industry in Newfoundland and Labrador, for potential employment contacts. Participants should have an up-to-date cover letter and resumé available, Hooper said, in a form that can be tailored for each use to appeal to both the position and employer under consideration. Another person should proofread the letter and resumé to correct spelling and grammatical errors. Once the resumé has been sent, participants should follow up by enquiring about the process and timing of interviews. Networking is the key to the hidden job market, Hooper said, and it is essential to talk to people who already work in a field of interest about careers in that area. She advised participants to attend career fairs and campus information sessions offered by recruiters, and to suggest mentorship or job shadowing opportunities while seeking paying work. They should also take volunteer positions. Carefully documenting all conversations and contacts made during a job search makes it easier to move forward, and to identify and thank those who helped. Hooper recommended that participants post their resumés on job search websites and in online newspapers. Looking for a job is a full time job, Hooper said. Keep a notebook with a record of contacts and have a self-promotional speech ready for any opportunity to meet a new one. Explore job directories such as the Canada Student Employment Guide and the Career Directory. Participants need to know themselves and their targets and stay positive during the search. Don’t give up, Hooper said. To maintain enthusiasm and energy, build a support group with other job seekers. Lanie Woodfine, Information and Networking Coordinator of the ILRC, said while everyone has the skills and knowledge to get the career he or she wants, most people face a challenge when moving from education to employment. Education does not only mean formal training, she said; all experiences, both negative and positive, are educational. In order to obtain work, she stressed the importance of educating oneself about the local community. After working in a video store, Woodfine returned to university for six years, obtaining a degree in social work. She told participants not to be intimidated by the prospect of completing a four-year university program. She said it is important to enrol in courses of interest and recognize that life issues may delay completion of a program. Woodfine said 85% of advertised employment opportunities are already filled by the time they appear in a newspaper. The federal government job bank is a good source outside the newspapers, as is the Internet, she said. She recommended volunteer opportunities as a good way to determine whether a career is a good fit for a participant’s skills and interests. She also stressed the value of identifying the kind of work one prefers before completing formal education. Woodfine said participants should do their homework and decide on a next step. She did not label herself as a social worker immediately after completing her education. Instead, to keep her options open, she marketed herself as someone who had a university education and looked at jobs that interested her. She said her disability mattered more to employers than she had anticipated, and that she educated them. First impressions can impede the progress of a person with a disability. Woodfine credited support from the Blundon Centre for helping her in educating the School of Social Work at Memorial University about making facilities accessible to wheelchair users. She said this advocacy work also helped her network while at university, and that she made lifelong contacts at Memorial, both with prospective employers and with the community at large. It is important to make contacts among employers and in the community and advise them of job search efforts, she said. Woodfine emphasized the importance of never giving up, despite the obstacles. If paid work is not available, she said, volunteering is a good way to obtain skills and to network. Jennison Asuncion said he began with NEADS while still a student by serving as Vice-President Internal from 1994–98. The position gave him the chance to network, and to gain leadership and other marketable skills. NEADS was founded in 1986 as a consumer-based, cross-disability organization. It is governed by students with disabilities and is a member group of the Council of Canadians with Disabilities. NEADS is governed by a twelve-member board of directors, with ten representatives from the provinces, one from the territories, and one open position. Student membership comprises college and university students with disabilities, Asuncion said, and graduates of a post-secondary institution. NEADS conducts research, provides information on financial aid and specialized funding, and operates a website: www.neads.ca. It hosts the NEADS-L email discussion list for students, which gives people opportunities to discuss current issues concerning their campuses and employment. 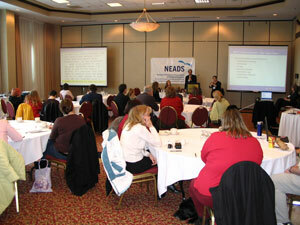 NEADS will hold its next biannual national conference in November 2008. NEADS employment initiatives began in the mid-1990s. The Employer Advisory Council to NEADS was established in 1994. In 1996, the Investing in the Future Mentorship Project was launched to pair students with employers. The first Student Leadership and Employment Forum was held in 2001 and events took place across Canada from 2001-2003 as part of Government of Canada sponsored project. The importance of this initiative was the link between leadership and employment, because those who develop leadership abilities are better able to transfer acquired skills into the working world. The Job Search Strategies Forums Project which began in 2005, partners NEADS with the Bank of Montreal. During the Student Leadership and Employment Forums Project, NEADS published Employment Connections, a guide for students, and Access to Success, which provides tips to employers. The NEADS online Work System (www.neads.ca) employment website was launched in 2003 and gives students the option to self-disclose a disability or impairment. Resumés and cover letters are posted by students and targeted to a distinct audience of potential employers, who can then contact applicants. Over 1,300 students and graduates are registered across Canada, along with 82 employers covering 23 industries. Among the registered employers, the top sectors seeking applicants are government departments, office administrators, human resources departments, Internet technology firms, and education and training institutions. Julia Munk said NEADS now offers scholarships to both graduate and undergraduate students, in the form of academic and group scholarships sponsored by BMO Capital Markets’ Equity Through Education Program. The group award component of the program assists applicants who lead projects to help students with disabilities on university and college campuses. Group scholarships are used to offset some of the costs associated with this kind of advocacy work. Up to 4 students with disabilities in different academic categories will receive $3,000 to cover part of the cost of their education. NEADS is also in process of developing a Mentorship Program. The intention is that this program we include the participation of private and public sector employers to be matched with post-secondary students with disabilities. There are several types of mentorship opportunities, Munk said, including job shadowing. A participant asked whether there are legal issues in mentoring, and Munk said that background checks of employer participants would be conducted. NEADS is working to ensure that the mentorship program will be a valuable one for students, she said. Another participant asked for NEADS’ plans to support students with learning disabilities. Asuncion said that designation of students with invisible disabilities does not explicitly exclude persons with mental health disabilities, and NEADS plans to do a focused study on students affected by them. It is incumbent on NEADS to understand students with all ranges of disabilities, he said. He plans to bring this issue to NEADS’ board of directors. A participant asked whether NEADS seeks links with other organizations such as the Arthritis Society and Asuncion said it would like to, with help from residents of the province to keep its database updated. Munk said NEADS is looking at its communications strategies and identifying contacts within student organizations is part of the strategy. Dillon said that when she attended university, a professor read her “Oh, the Places You’ll Go!” by Dr. Seuss, as an allegory of the challenges and joys associated with conducting a job search. She told the participants that they would experience days when their job search is difficult, but that each of them has the resources to overcome any obstacles. Asuncion asked delegates to complete the formal evaluation of the forum, and to make recommendations to improve the proceedings. Dillon told participants to create advantages for themselves and to establish a support team to provide feedback and guidance during the job search. She reiterated the value of volunteer work and mentoring experiences. Transferable skills are useful and should be identified, she said. It is essential to ask for accommodations in school and in the workplace. Disclosure of a disability is a personal decision, and one for which she said she found it difficult to gain confidence, but it does become easier with experience. Resumés, cover letters, and interview techniques should all highlight personal skills and abilities. Dillon said that reading a resumé should give its owner a sense of pride. Organization skills, including researching possible employers, keeping notes, and developing a network, are important, Dillon said. Equally critical is following up on potential leads. A well-thought-out plan is critical in gaining the skills needed to obtain employment in the participants’ field of choice, she said.